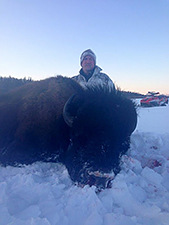 Our specialty is helping hunters to achieve the goal of harvesting an Alberta bison either with gun or bow by putting you with in range a trophy bull. 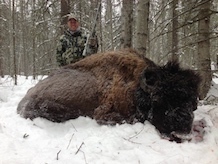 Alberta wild wood bison hunting is one of North America’s most challenging hunting experiences. 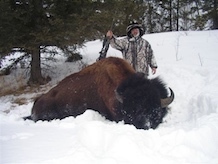 In Alberta we have a high population of wild buffalo insuring a successful Alberta bison hunt. Wild wood bison live in very remote areas of Alberta and are very illusive. Alberta wood bison get big, many a buffalo tip the scales over 2500lbs and our biggest to date was 3000 lbs. 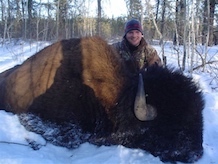 We guide in the areas that have produced trophy bison, time and time again. 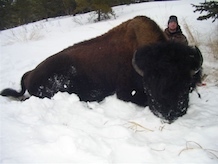 Our specialty is helping hunters to achieve the goal of harvesting an Alberta bison either with gun or bow by putting you with in range a trophy bull. 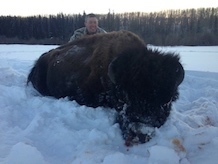 We do this by taking hunters on customized personally guided hunts in the best wild wood bison hunting areas available in Alberta. We have exclusive knowledge of bison, there travel movements and territories. 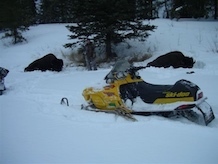 Master Guide Chad SAVAGE Lenz will take you to the deepest darkest wilderness to get you on a trophy Alberta wood bison. 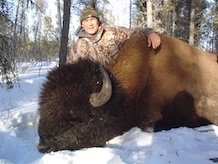 We take our hunters to the best Alberta buffalo hunting areas with the highest success rates. Your research ends hear with your quest for the Alberta wood bison! !